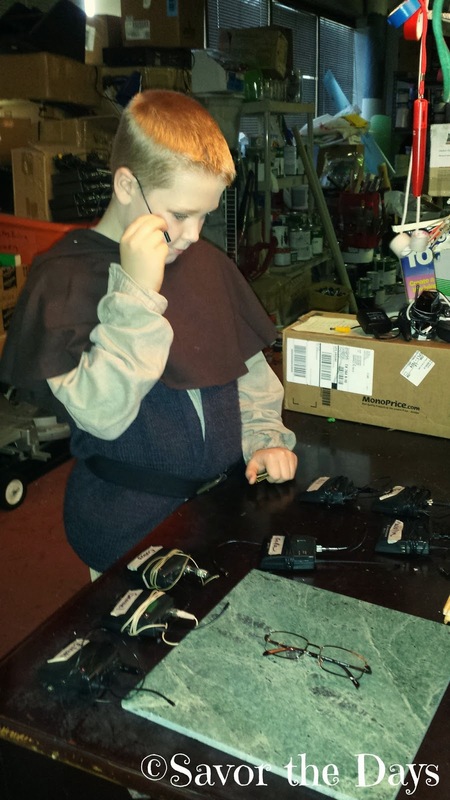 As we wrap up the first weekend of The Hobbit, I decided to tag along with Nicholas as he got ready for the show. He starts with putting on his costume. He wears comfortable shorts and a t-shirt to the theater so that he can just slide his costume pieces over his clothes. Having clothes on underneath the costumes keep them cleaner so they can go all 8 shows before being washed but it also cuts down on dressing time. Once he is in costume, he grabs his makeup pencil and gets in line for makeup. He has simple boy stage makeup as a dwarf. Once his makeup is done, he goes backstage to hook up his microphone. I was surprised that he has learned to do this on his own but he does. He used mic tape to help secure the mic in place. Next he heads back down to costuming to finish getting into costume. He was surprised on opening night to learn that he would be wearing a wig. He wasn't thrilled with it but he is actually more disappointed that he doesn't have facial hair as part of his costume. He starts with putting on his wig cap. 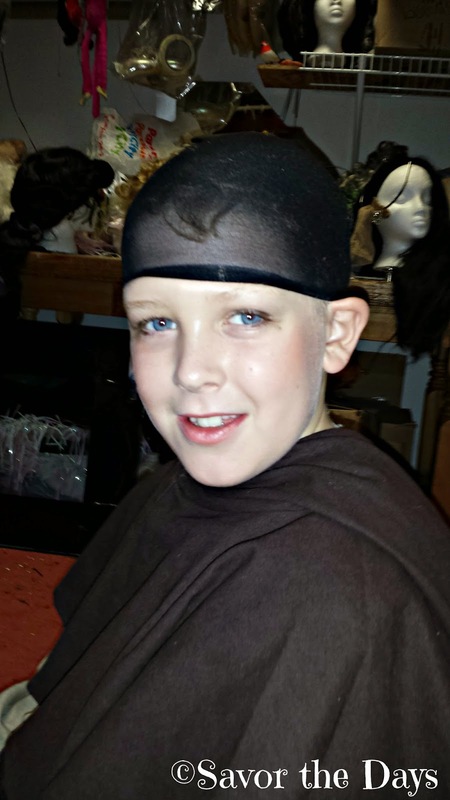 The wig cap helps to hold his natural hair in place and give the bobby pins something to grip to. 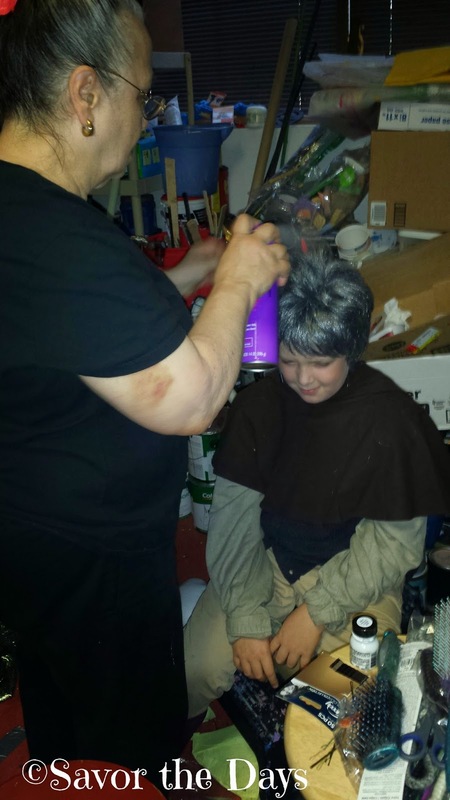 It also helps to keep the wig clean by putting a barrier between the kids' sweaty heads and the wigs. Next he waits in line while Ms. Joe Ann styles everyone's wigs. She is the founder of the Actors Conservatory Theatre and the director for The Hobbit so it was neat getting to hear her talk with the actors as she fixed their wigs. She has so much knowledge and experience in the theater. 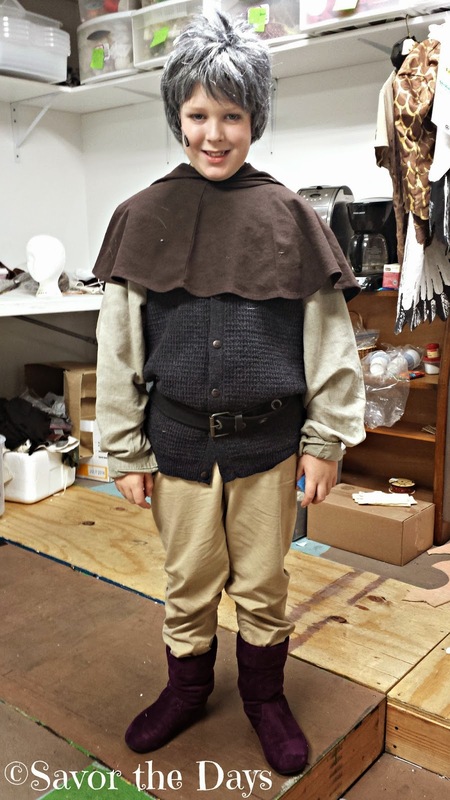 Finally, Nicholas is ready to perform his heart out on stage as the awesome little dwarf, Bifur. 4 shows down and 4 more to go next weekend!